Did you turn on a VPN this morning and then start Local? Sometimes that can cause issues with VirtualBox/Docker. 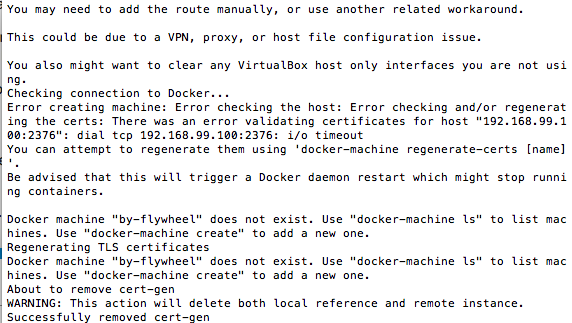 I see in the log it suggests docker-machine regenerate-certs [name] may regenerate them, would that work here? I did though I do that every morning and has never been an issue before. I saw that suggestion on other threads so after rebooting I tried launching without the vpn several times. I haven’t had the VPN on since and still no luck. For what it’s worth, Local is automatically attempting that regenerate-certs command. Awesome I can’t thank you enough Clay, I’m deploying a client site soon so your speed at getting back to me will keep me from hitting a wall. Much appreciated. Thanks so much that did the trick! Is there a way I can prevent this from happening again? Thanks so much that did the trick! Is there a way I can prevent this from happening again? I’m not sure at the moment but if I find out more we’ll most likely build preventative measures into Local itself. I am experiencing this same problem. I tried the recommended steps above without luck. I’ve tried the remedies suggested in other threads as well (restarting local, upgrading Virtual Box, rebooting my system). One thing I’ve noticed while Local is cycling through the Regenerating Docker Machine TLS Certificates message, the certs are being created in my Local vm directory, then being recreated again and again. It’s like Local is stuck in a loop. I have a dozen dev sites installed on Local and need to regain access. Any help is greatly appreciated. For some reason, I wasn’t able to alias the docker-machine command. However, I was able to run the second set of commands by changing “local-docker-machine” to “docker-machine”. And now Local is starting without looping on certificate regeneration. Still having this issue, even with the couple fixes mentioned here. Trying to reinstall I’m also getting the error. Is there a new version of Local forthcoming? I’m having the same issue. Shell commands didnt fix the issue, still stuck regenerating Docker Machine TLS Certs when opening Local. 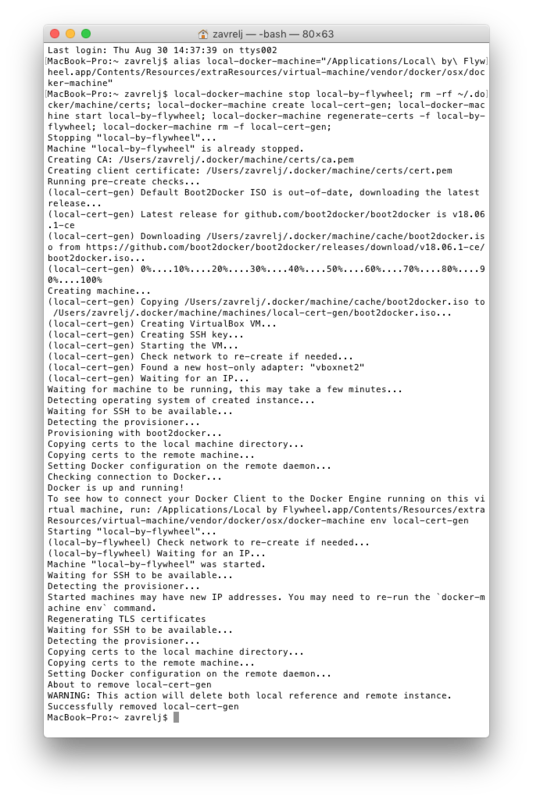 rocket55@rocket55s-mbp-6  ~  alias local-docker-machine="/Applications/Local\ by\ Flywheel.app/Contents/Resources/extraResources/virtual-machine/vendor/docker/osx/docker-machine"
Machine “local-by-flywheel” is already stopped. Followed instructions here. Nothing changed, still getting the same message. Any ideas? Thank you! This worked for me as well. I’m not sure if it’s relevant, but I had Docker installed prior to installing Local and while running Local I also run two docker containers for my development project via docker-compose. But this is probably not an issue… Anyway here’s the screenshot with Terminal output of the steps described above that solved the issue. Warning - it takes really long time for the second command to finish! I also had the same issue here. I followed the above guide but it didn’t work. Then ran the step 4 command it was not working (“No such file or directory”) So I replace the command “local-docker” to just “docker” following the other’s approach. the “Regenerating Docker Machine Certificates …” message is repetitively shown. Sometimes I can see the screen “Looks like you haven’t create …” some normal screen but it only lasts for one or two seconds then the Regenerating Docker Machine Certificates …" message and the “Checking System” is shown so I can not do any works here. After this “There was an error validating certificates for host” error, I just kept going but it was never ended for the 2nd bar part. So I googled and the answer was just turning off the local by flywheel in the virtualbox and restart the local by flywheel. So I did then the issue for the “Regenerating Machine Certificates” is newly detected. I solved this after uninstalling the local and install again. Maybe I had the issue when installing this. I refer to the below link to uninstall the local. How do I uninstall Local on macOS? I wanted to say that this solution did seem to work for me on macOS. (The “alias” command only creates a shortcut name for several commands to the docker-machine…) If this is still a problem, give the procedure a try again.